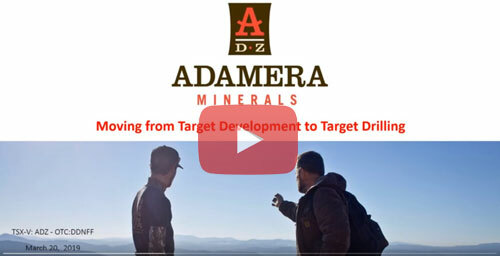 Vancouver, B.C., March 20, 2019 - Adamera Minerals Corp. (TSX V: ADZ; OTC: DDNFF) is preparing for 2019 exploration after having completed a multi-year target generation program in Washington State. The focus has now progressed from target generation to systematic drill testing. This update provides information on the methodology used to develop targets and a broad description of those targets. The update and video are the first of a series of reviews (with videos) scheduled for release in the coming weeks. Enjoy the video and watch for the upcoming target summaries. “Working within our budget constraints, our targeting programs have led to the discovery of several new zones with high-grade gold mineralization that now require follow up. We have developed over 30 targets integrating our geological, geophysical and geochemical data. As our targeting has advanced, Adamera has progressed to where a significantly larger program is warranted. Clearly the potential for a major discovery has never been better,” says Mark Kolebaba, President and CEO of Adamera Minerals Corp. Since 2013, Adamera has had the sole focus of exploring for high-grade gold in the Republic district of Washington State. Naturally the geological models have evolved over time as the Company has narrowed in on specific targets in each region. Properties including Flag Hill, Oversight, Lambert Creek, Goodfoot, Lamefoot South and Empire Creek meet these requirements. Surveys including electromagnetics and induced polarization which were little used in the past were applied for the first time in many instances. Basic geological mapping and interpretations were redone to better integrate structural and geophysical data. Finally, drilling with a small company-owned rig to prioritize targets has proven to be cost-effective and invaluable. G. Gibson and M. St. Pierre are qualified persons that have reviewed various data and programs related to the projects.